I do love a good cleanser – a proper, massage-it-in, take-it-off-with-a-cloth kind of cleanser. If I have a full face of makeup (and actually, even if i don’t) I like to spend a good while massaging, cleansing and rinsing thoroughly, usually repeating the process to make sure that I’ve got all of that deep-seated grime and oil. Cleansing balms and creams (“hot cloth cleansers”) are my product of choice for the evening cleansing ritual, and you’ll probably already know that if you’ve been reading A Model Recommends for a while. I do use face washes and micellar waters and cleansing lotions, but usually as a hasty morning wash or, very occasionally, as a lazy quick-fix if I’m extraordinarily tired or if I’m on an aeroplane. Inside the squat pot [ugh, I’ll edit that out once I’ve found a better phrase] there’s a hard, lard-like substance [again, find a better description] that can be scooped out and then melted between your fingertips. You don’t need very much at all, in fact the hard texture makes it more difficult to scoop out excessive amounts. (Unlike my Emma Hardie balm, the fragrant cleansing delight, which I slather on as though the world’s about to end.) 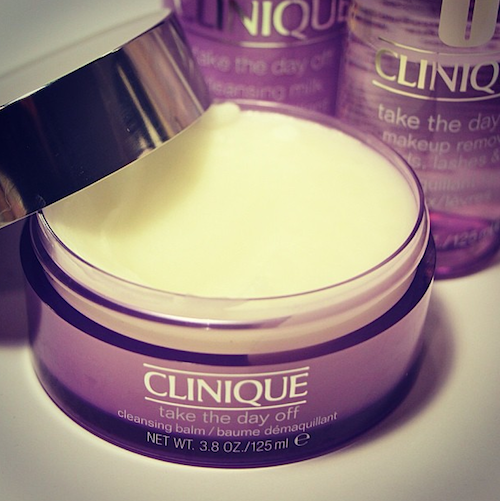 The Clinique balm is unfragranced, which I imagine will be a huge bonus for many, and the formula is gentle and non-stripping. The balm melts to an oil that slips nicely across the skin so that you can really massage it in. It removes every last trace of makeup but rinses clean and if you have oily skin and are worried about using oil: fear not. This cleanser rinses completely clean – there’s absolutely no residue left behind and it’s not greasy at all. Surprising considering the initial waxy, lardy texture, but there you are. Never judge a book by its cover and all that. Next Post The V-Word and Rose-Scented Things.